Recently, First Focus published this fact sheet detailing the internationally popular practice of establishing children’s commissions and ombudsman offices. To date, more than 40 countries have established children’s advocates within government, who speak on behalf of that country’s kids in legislative discourse. A similar body could be hugely beneficial for children in the United States. In England, the office of the Children’s Commissioner deals in policy recommendations, research, and complaint review. Anne Longfield is the current commissioner, and therefore acts as the voice of all English kids in the government. She is supported by a staff of experts in the fields of child development, education, health, and more, that help recommend programs and policies, as well as work with communities to protect child rights. The United States currently has a series of similar bodies, but these organizations operate mostly on the state and local level. For instance, Connecticut has a statewide child advocate who is appointed by the Governor, and Tennessee has a network of “councils for children and youth” that come together to form a state commission. These bodies do great work on behalf of children in their state, but they unfortunately aren’t able to influence policy or reach a large number of kids. A commissioner, on the other hand, would be able to directly influence the legislative process through research and reports. They could take the great work being done on the state level to the federal stage and advocate on behalf of all American children. The commission could further bring the issue of child rights and well being into the national discussion by providing a children’s perspective on new legislation. As a quarter of the population, children deserve to have some sort of representative advocating for them in government. In the world of child advocacy, it’s not uncommon to look to other countries as examples, especially when they have demonstrated measurable benefits for kids. 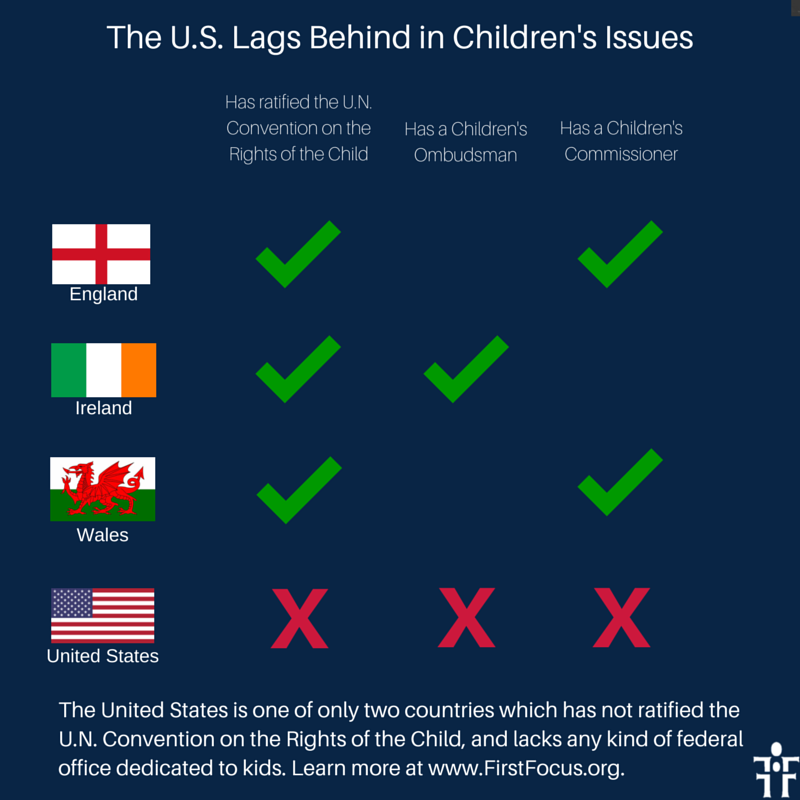 Let’s take our queue from these countries and establish a national commission to forward the best interest of American children. Want to learn more? First Focus is a bipartisan advocacy organization dedicated to making children and families the priority in federal policy and budget decisions. Read more about our work on child rights.